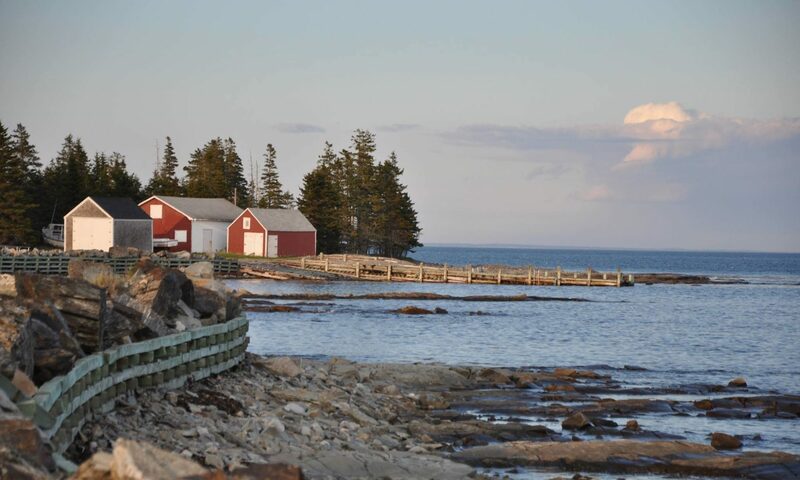 Q: Boaters – We’re planning a trip to Tancook and want to dock and explore the island. Can you help us understand docking privileges in Northwest Cove? A: Once Lobster season closes on May 31, boaters are welcome to tie up along-side the lobster boats docked at the main wharf. As a courtesy, you can contact David Baker, Harbour Authority of Tancook Island representative to advise of your docking location and expected length of stay – Phone 902.299.0035. Q: How do you get supplies to the island? A: Almost everything is shipped by way of the ferry. Groceries and small items get loaded from our mainland vehicles into large freight boxes that the ferry crew load by crane onto the boat. Larger items, such as building supplies, appliances or furniture, get loaded onto wooden trays or in cattle boxes. Cattle boxes are so named because years ago when there were many farmers on the island, cattle would be shipped to the island in these boxes. When the ferry reaches the island, the boxes and trays are unloaded from the boat. Each person gathers their supplies from the boxes and loads them into their island vehicle to take home. Many people use large plastic tote containers or large bags, with their names written on them, to put their groceries in for transporting because it makes it easier to keep all of the groceries together. Gas may be transported in small plastic jugs, although there is a limit to the amount that the ferry can take on passenger runs. A special trip is made on the last Saturday of each month to transport gas in larger amounts. Q: Do the children go to school on the island? A: We have an elementary school where children from grade primary to grade five are taught. When the students reach grade six, they travel each day on the ferry to attend school in Chester. Q: Are there walking trails along the shoreline ? A: Much of the road is along the shoreline. There are trails in the woods but they are sometimes overgrown with brush and blocked with fallen trees. Much of the shoreline is cliff which makes passage challenging but not impossible. Southeast Cove is generally easy to walk with some rocky areas. Q: Where can we go if we encounter bad weather ? A: The Recreational Centre will be open to visitors this summer with a tourist ambassador there to help you with any questions you have. Wishing Stones Gallery, Museum & Library has an area for reading, playing a game, or mingling with other folk. Also, there is a building on the government wharf that would shelter you while you wait for the ferry departure. Q: Can I bring my bicycle ? A: Yes, A bike is a great way to get around on Tancook. Ask the ferry crew to help you get it on the ferry. Q: Can I bring my car ? Q: Do people live here year round ? A: There are about 120 people living full time here. When you count the part-timers and weekend residents you can double that number. Q: What are winters like on the island? A: The island doesn’t get as much snow as the mainland, probably because we are surrounded by the sea. When we do get snow, it usually doesn’t last very long. We get a lot of high winds in the winter months, particularly January through March. They can be fierce and raw and really make a lot of island residents thankful for their woodstoves. When there is a long cold snap, the ponds freeze enough for us to ice skate on and there have been rare occasions that the bays and harbours freeze over with thick pads of sea ice. Q: What kinds of wild animals live on the island? A: We have white-tailed deer, muskrats, rabbits, mice, snakes and many birds. Once in a while an otter will be seen coming out of the sea to enjoy a swim in one of the ponds. As well, seal pups are occasionally spotted in Northwest Cove near the wharf. The mother seal drops her pup off for a few hours to bask in the sun while she swims out to sea to feed. Q: Many of the island vehicles don’t seem to have license plates. Do the island vehicles need to be registered or inspected? A: Many of the island vehicles are not inspected or registered. Because of the dirt roads and salty air, vehicles deteriorate much more rapidly here than on the mainland, so many islanders look for very inexpensive vehicles that will hopefully last for a couple of years. These vehicles may not be road-worthy on the mainland, but are fine for getting you around the island. Q: What do you do if you run out of bread or toilet paper or any other necessary grocery item? A: Borrow from your neighbour or plan a trip to the mainland for some shopping.